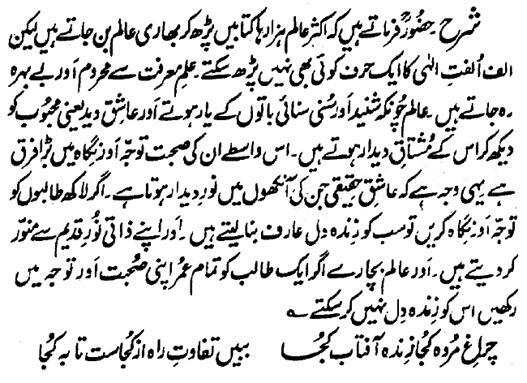 Hazrat Sultan Bahu Rahmatu-Allahe Ta-aala Alaihe says that many Ulema become big Aalim after reading thousands of books but they cannot read even a letter of the word 'Ulfat e Elahi' (familiarity with Lord). They remain deprived of and unprivileged from the Ilm of Marifat. Since Ulema are the friends of the listened and heard things while the Aashiq are friends of seeing, that is, are curious of the Didaar of the Beloved after having seen Him, therefore, there is huge difference in their company, Tawajuh and Gaze. That is the reason that those real Aashiqeen, in whose eyes is present the Noor of Didaar, they turn hundreds of thousands of Seekers the Living-Hearted Arifeen through Tawajuh and Gaze if they will so and can illuminate them through their Prehistoric Noor of the essence whereas the poor Ulema cannot make even one Seeker Living-Hearted even if they keep him in their companionship and Tawajuh all their life!